On the invitation of Ukrainian President Petro Poroshenko, Hereditary Prince Alois and Hereditary Princess Sophie made an official visit to the Ukraine this week. 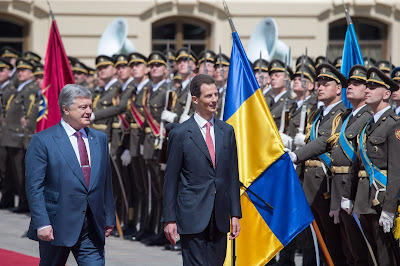 On Wednesday, the hereditary princely couple was welcomed on the square near the Mariyinsky Palace in Kyiv with military honours. In addition to talks with President Poroshenko, the Hereditary Prince also met with Prime Minister Volodymyr Groysman as well as Parliament Chairman Andriy Parubiy. 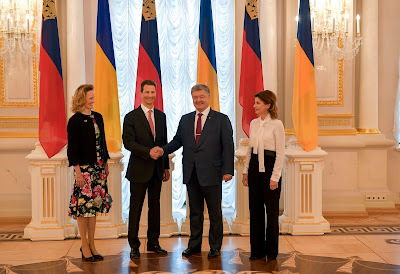 Hereditary Princess Sophie and the wife of President Poroshenko held talks with representatives of the International Red Cross working in the Ukraine as well as members of the Ukrainian Red Cross. Together the Hereditary Prince and Hereditary Princess laid a wreath of flowers at the Tomb of the Unknown Soldier, ears of grain at the Holodomar memorial and flowers at the Maidan memorial. The couple rounded off their visit with a trip to Lviv today.